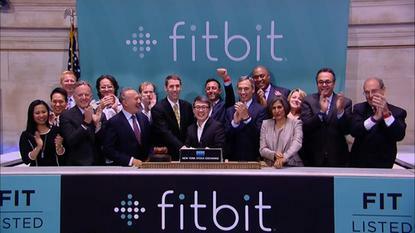 Executives of FitBit ring the opening bell and celebrate the start of trading of FitBit stock at the New York Stock Exchange on June 18, 2015. Fitbit sprinted into Wall Street in its debut as a public company Thursday, as its shares opened 52 percent higher than the price that the wearables company had set for them. Priced at US$20 on Wednesday, the stock instead opened at $30.40. Earlier in the week Fitbit had increased the price range of its IPO to $17 to $19 from the original range of $14 to $16. With its shares trading for around $30, Fitbit is worth approximately $6 billion dollars. Fitbit's wearables collect health and fitness data, including calories burned and steps walked. While smartwatches also offer these features, some analysts are bullish about fitness trackers, saying that they generally have simpler user interfaces, longer battery lives and lower prices. In its IPO filing, Fitbit said it held an 85 percent share of the U.S. activity tracker market for the first quarter of 2015, citing figures from research firm the NPD Group. Competitors include Garmin and Jawbone, which recently filed two lawsuits against Fitbit, as well as Asian consumer electronics companies such as HTC and Xiaomi. According to an IDC study released Thursday, 72.1 million wearable devices will ship globally this year, compared to the 26.4 million units shipped in 2014, a 173.3 percent year-over-year increase. Wearable sales will continue to increase in the coming years. IDC expects global shipments to reach 155.7 million units in 2019. Wearable makers may want to consider allowing third-party apps to run on their products, judging by IDC's predictions for the market. Smart wearables, which IDC defined as devices that can run third-party apps, will eclipse shipments of basic wearables in 2016 and hold this lead into 2019. This year, 39 million basic wearables will ship compared to around 33 million smart wearables. However, in 2019, approximately 66 million basic wearables will ship compared to about 89 million smart wearables. Device manufacturers are just starting to develop smart wearables, a product category that includes the Apple Watch and Microsoft's HoloLens, according to IDC.